Whaaaa??? Are you kidding me. Seriously. I mean… No you didn’t! Oh, and in case you were wondering, those *are* harsh browns underneath the burger. Greatest breakfast sandwich of all time? I’m trembling just thinking about it. 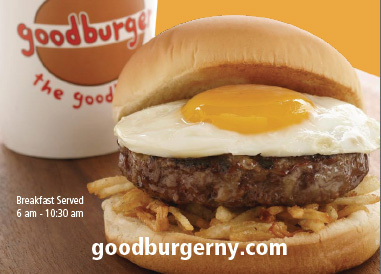 For $5.95, you get hash browns, topped with a hamburger, topped with a fried egg. $6 may seem like a lot for breakfast, but it comes with a free coffee (making it a slightly better deal), and after one bite, you kind of feel like Goodburger is the one getting ripped off. I’ve only had it once, so I don’t know if it’s too early to say this… but I think I’m in love. Despite what the flyer above says, I think they actually serve it until 11am- but I hereby declare it my mission to get this thing added to the Goodburger lunch menu. And no excuses! “We don’t time or room on the grill to fry eggs during lunch-” blah blah blah. Quit your whining and make it happen Goodburger! This is how you carve your niche in the Midtown burger scene. The crabcake sandwich is good, but this takes it another level. Posted by Zach Brooks at 8:24 am, May 7th, 2008 under *Lex btw. 54+55th, 45th btw. 5+6th, Breakfast, Burger, Goodburger. omg that looks deadly…and delicious! looks like gb’s cracked the code: you can’t. beat. egg yolk. It does look really good, perhaps some ketchup+mayo spread. Reminds me of a Texas burger at Pauls(2nd ave and St Marks Pl), with sautÃ©ed onions. I like the hash brown idea, seems like it would add some nice spice and flavor. 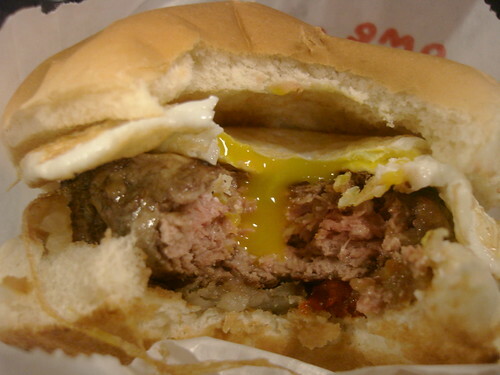 While I love rare meat, and love sunny side up eggs (and alternate between either dipping my bacon in the yolk or um, if I’m at home, slurping the yolk right into my greedy mouth…)… something about the yolk dripping down onto the even-slightly-too-done-for-my-tastes burger… skeeves me. I think I must be sick… boo… why can’t these places exist near me! I’d be an oh-so-very-fat-and-poor girl! I don’t know?? Adding Bacon might create a breakfast of such grandiose deliciousness that that our heads might explode! And that would be messy. If eating that is wrong, I don’t wanna be right! categorize this breakfast under “Joygams”. OMG – that looks unreal. I agree with the others – adding bacon could create one of the greatest breakfast sandos of all time. I am a big proponent of adding a fried egg to my burger Aussie style but the hash browns – nice touch. Are there onions in the hash browns? That would be a nice addition. I gotta try one of these things. Shouldn’t there be cheese as well, if bacon is being discussed? Hell, just give me a coronary already!! *hums*When I think about you I touch myself….. Considering its good burger…what does it cost, $6? Butter yes, and a slice of Black Pudding. If your going to do the cholesterol special you may as well go for it. Dombrooks- SANDO? F’real? REALLY? I mean, come on. It was disturbing enough when it became ressies for reservations… and then resto for restaurant… do we really need SANDO? Can’t we stick with SAMMY, if you really want to shorten it? SANDWICH is 2 syllables, as is SANDO. COME ON… Enough bastardizing of the English language! Yvo.. I think Quizzoh-no’s trademarked the term “Sammy” for those lil toddler flatbreads they are selling on tv where they make it look like you’re getting a 6 inch flatbread “sammy” for 2 bucks or whatever it is. I think Dom is mearly trying not to get sued for use of the copyrighted term… just like I stopped wearing the color Magenta… damn t-mobile. That sandwich looks like a great deal of intestinal trouble. And my wife agrees with me. I came down with a rather debilitating bout of salmonella poisoning last year. We kept no filthy turtles in our home, though I did have a rather impressive collection of anoles (which I named after Food Network personalities), as well as my beloved housecat, Mr. Wiggles. My doctor ruled out Mr. Wiggles and told me that the cause was likely the anoles, my daily sunny-side up egg or the never-ending salad bowl at the Olive Garden, which I used to patronize several times a week. After what I went through (I will not get into the details here), I humanely disposed of the anoles and vowed never to eat eggs or restaurant salads again. Good God – I forgot a nice slice of American cheese. Southeastmidtowner excellent call I don’t know where my head was. Yvo – Sando is an endearing term for something I love very much – yes – I will continue to call it Sando. And I am all for bastardizing the English language. Sando has caught on – ressie and resto have not. Yvo Embrace sando – don’t fight the feeling. Chucky, i think you misheared the Doctor; he blamed “the arseholes living here”…..not anoles. Call me fat but I keep envisioning that burger as a giant sausage patty.